There really isn't any type of firearms practice that renders as many benefits as dry fire training for as little investment. No ammunition is required, nor is ear protection, so the costs are basically nil unless you buy a few snap caps. Here are five dry fire drills that are incredible practice, which you can do for basically free. Just be sure to remember the four laws of gun safety. One of the best dry fire drills is the most basic - the Wall Drill. This drill was invented by George Harris, a former Sig Academy instructor. According to the man himself on US Concealed Carry, he came up it with while in the military. He called it the Wall Drill when he taught it to his students and the name stuck. The point of the drill isn't speed of draw or target acquisition per se, but rather developing trigger control, leading to muzzle control and thus greater accuracy. 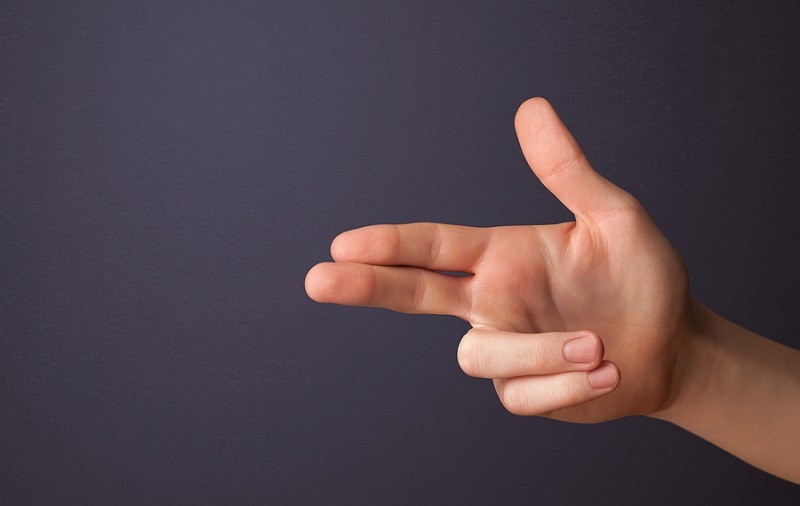 For this dry firing exercise, start with an unloaded firearm and a blank, ideally lightly-colored wall. For the sake of safety, do so in a safe direction with sufficient backstop; a basement is ideal. Bring the firearm up and align the front and rear sights, with the muzzle an inch or two away from the wall. Don't focus on a target, but rather the front sight through the rear sight. Once aligned, operate the trigger. What should happen is the gun will "click" and the front sight should not move. 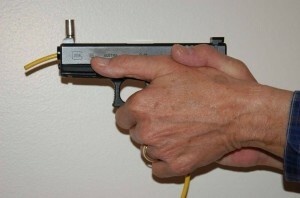 If the front sight moves, your trigger pull is causing the pistol to move, which it shouldn't. Harder trigger pulls tend to move the other fingers with the motion, so you want to adjust, attenuate and refine your grip and trigger pull until the front sight (and therefore the muzzle) doesn't move with the trigger pull. The benefit of this dry fire drill is that If the muzzle doesn't move when you actuate the trigger, your accuracy while live firing should improve considerably. A similar type of dry fire practice to the Wall Drill are balance drills. The most common version is balancing a penny or empty brass shell on the top of the barrel directly behind or on the front sight, which is why a lot of people call this the "Penny Drill." Any coin could be used. Some people use a metal washer and call it the "Washer Drill." Balance the penny, other coin or washer on the barrel, then aim and (dry) fire. If you do it right, the penny won't move. Just like the wall drill, the goal is to refine grip and trigger motion so that your sights don't move when you pull the trigger. Refine your grip and trigger motion until the penny is stationary when the trigger is pulled. One very easy dry fire exercise is a simple sight and fire drill. Holding your pistol at rest - say in your strong hand at your side - simply raise the pistol to firing position, acquire a target in the sights and dry fire. You don't even need to necessarily dry fire the pistol; practicing sight acquisition in and of itself is very valuable. Start slowly; if you practice slowly but correctly, you will eventually be able to acquire a target quickly and correctly. It's better to learn good shooting habits from the start than to correct bad ones later. To practice a dry fire draw, first select a target of some sort. Clear your firearm of any ammunition, then double check. Triple check, just to be safe. Then holster the weapon. To practice, draw and acquire the target with the sights and (dry) fire. There are a few variations you can introduce. Some recommend 10 repetitions of drawing and sighting before ever pulling the trigger, to practice the drawing motion. If gaining speed is the ultimate goal, start practicing this drill slowly and smoothly. As with any other manual skill, practicing slowly and smoothly eventually leads to speed. Special timers for shooting drills are available if you want to time yourself. While drills of this nature are part of many pistol competitions, it's also a good drill to develop defensive shooting skills. A more advanced version of drawing dry fire drills are turn and draw drills. The shooter turns, draws, sights and fires. While a good drill for self-defense, it's also an event in some shooting competitions. This can be a simple turn, draw and fire drill or a more complex exercise such as the "El Prez" drill, where one turns and engages multiple targets. Turn your back to the target. Turn around, leading with your head until you square with the target. Draw, acquire a sight picture and dry fire. Just as with the simple draw drill, start slow and smooth until you acquire more speed. A brief word on dry fire safety. First, always observe the four rules of gun safety. Second, if you're going to engage in dry fire practice, make sure to clear any and all ammunition from the firearm. Double and triple check that it's unloaded. Unless impossible to avoid, don't practice in a room that has any ammunition in it. 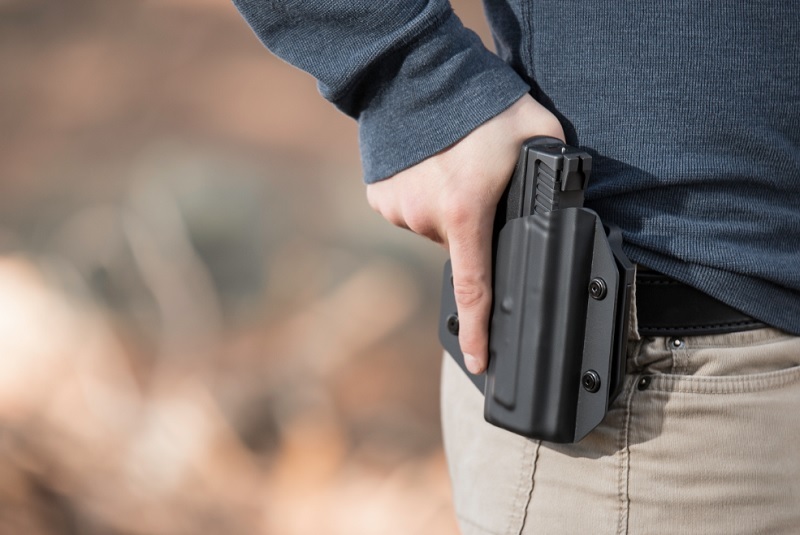 Do NOT rely on a mechanical safety for trigger or sight practice with a loaded firearm. Just use common sense, and stay safe.